Opinion Outpost is literally one of my top two favorite survey panels on the internet. 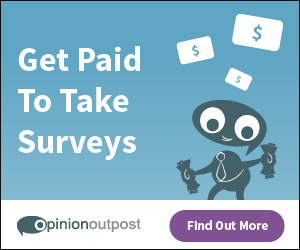 It seems I get access to way more surveys with them a day, in turn earning me more rewards. They offer their members the opportunity to take marketing research surveys in exchange for rewards like PayPal cash or Amazon gift cards. Voice your opinion and shape the products and services that touch your life. Sharing your opinion has never been so rewarding. It's as easy as 1 - 2 - 3!